Scheduled around the full moon, this is truly a unique kayaking experience. Depart during daylight to see all of the beauty of the Black Canyon, including historical sites and desert wildlife. You'll then beach your kayaks as the sun sets on the Colorado River. Roast hot dogs over the bonfire before returning to Willow Beach under the stars. Your tour will be scheduled based on seasonality (between 4:30pm and 6pm) and will start with transportation from Las Vegas to launch site. As you launch our kayaks from Willow Beach, you'll enjoy a paddle through beautiful Black Canyon and its historical features. Watch the shores as evening approaches as desert wildlife makes their way down to the river. After a 2-mile paddle, you will watch the sun set from the shores of the Colorado River toasting hot dogs next to a roaring fire. 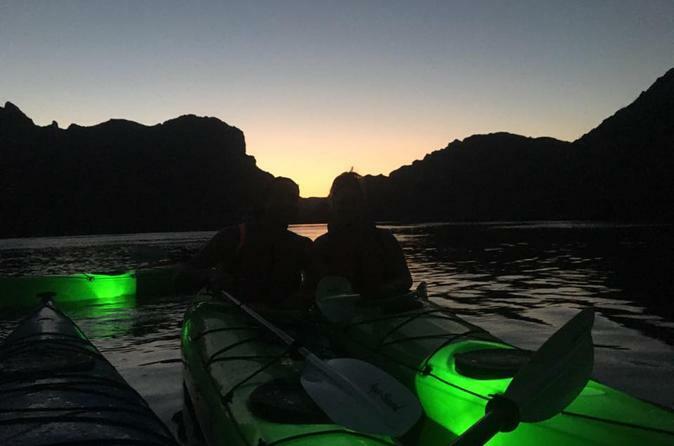 When it's time to return, your guide will light up your kayaks so they glow in the dark! On the way back downstream, the stars will begin to shine and a peaceful quiet will descend upon the river. This is truly an amazing opportunity to experience the solitude and grandeur of the Canyon. All necessary equipment, National Park fees, snacks and hotel pickup and drop-off by a comfortable Mercedes Sprinter are included.